Each PC-1N model comes housed in a standard compact 2U chassis. Even with a substantial power rating of 900 watts per channel, the PC9501N (2 x 900 watts @ 8 ohms) weighs only 13 kg - 50% less than conventional models in its class. * There's also the PC6501N (2 x 650 watts @ 8 ohms), the PC4801N (2 x 450 watts @ 8 ohms), PC3301N (2 x 315 watts @ 8 ohms) and the PC2001N (2 x 200 watts @ 8 ohms) - all featuring the kind of sound quality and reliability that only the PC Series can deliver. * Comparison with previous Yamaha models. The PC-1N series features smaller components throughout thanks to the improved efficiency achieved by the new switching regulator and EEEngine technology. Smaller part size, in turn, gave Yamaha engineers new freedom in component layout, offering a wider range of alternatives in choosing parts, circuit design, and internal layout that could be implemented to maximize sound quality and reliability. As you can see in the photo below, PC-1N models feature a performance-enhancing symmetrical layout. Circuit boards prone to heat generation, for instance, have been located on both sides of the amplifier with large heat sinks and low-noise variable-speed cooling fans. This arrangement also absorbs vibration that can result in unwanted noise. Also, heat sinks are mounted to the side panels with insulated screws to eliminate chassis resonance that can cause noise. All PC-1N models feature stereo, dual mono and bridged mono modes for extra versatility. In the stereo mode the two channels are independent. The parallel (dual mono) mode allows a single mono input signal to drive both channels and two independent speaker systems. And in the bridge mode, both channels work together to deliver maximum power. The rear panel MODE switch lets you change modes quickly and easily. The PC3301N was specially designed to drive high-impedance loads with multiple parallel-connected 100-volt line speakers, for use as a distribution amplifier in installations. Multiple I/O Connections Plus Subsonic Filter A comprehensive array of rear-panel terminals and connectors lets you use the PC-1N Series amplifiers with the widest possible range of systems and equipment. Balanced XLR (XLR3-32) and Euroblock terminal inputs allow quick, easy connection. All models also come with a built-in high-pass (subsonic) filter that cuts frequencies below 20 Hz. 5-way heavy-duty binding-post terminals and Speakon™ connectors ensure solid, reliable speaker connections. All models are equipped with a lockable/detachable power supply connector. 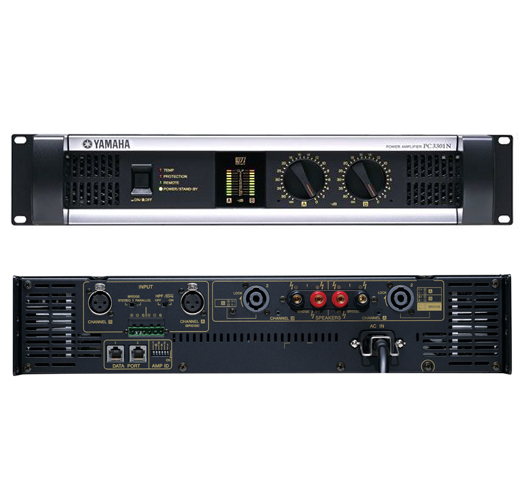 Each PC-1N Series amplifier can be connected to a Yamaha ACU16-C amplifier control unit (optional) and Windows-based computer via a rear-panel RJ-45 connector to allow monitoring and control of amplifiers and speakers. You can set amplifier ID via a 5-bit DIP switch, so up to 32 PC-1N units can be serially connected via one ACU16-C. If a protection system is activated in any of the amplifiers the NetworkAmp Manager software running on the system computer automatically displays a pop-up warning window and logs the current parameters for quick, easy troubleshooting, even in complex amp systems. The optional NHB32-C Network Hub/Bridge can be used to monitor/control the entire system via CobraNet™ - while well as using the ACU16-C as a high-quality 24-bit DA converter. An advanced Yamaha switching regulator and high-efficiency EEEngine technology give the PC-1N Series amplifiers high-quality sound and exceptional power with dramatically reduced power consumption and a new compact size. The switching regulator stabilizes output voltage and current - even when line voltage varies - for maximum drive efficiency. This means that, unlike conventional linear power supplies that use a transformer, the switching regulator guarantees dynamic reproduction with faultless stability even at high output levels. This improved efficiency is also the key to other important PC-1N features such as reduced heat generation, longer component life, lighter weight, more compact dimensions, and lower power consumption. Expect clear, stable, high-quality sound in installed systems with long power cables as well as large-scale outdoor live sound applications with unstable primary power sources. EEEngine technology further reduces power consumption without sacrificing sound quality. An independent auxiliary power line and high-speed voltage buffer guarantee split-second response to fast sound transients. New MOSFET (Metal Oxide Semiconductor Field Effect Transistor) circuitry in the high-efficiency current buffer boosts PC-1N Series efficiency by as much as 200% - that's 50% lower power consumption - over conventional class-AB amplifiers. * The PC9501N, for instance, draws a mere 950 watts of power with both channels driven at maximum power into 4-ohm loads. * Comparison with previous Yamaha class-AB amplifiers. The PC-1N features an impressive array of protection circuitry and indicators for stable operation and accurate monitoring. The 10-segment LED level meters on the front panel ensure accurate level monitoring even under poor lighting conditions. If output distortion exceeds 1% the red CLIP indicator lights and the PC limiter activates automatically. DC voltage protection activates the speaker protection circuitry and causes the PROTECTION indicator to light if surges of excess current are detected. The high-efficiency EEEngine simply won't overheat under most circumstances, but the TEMP lamp will light if heat sink temperature rises above 85 degrees cersius. At temperatures over 90 degrees celsius the thermal protection circuit automatically shuts down the system. The 31-step level controls for channels A and B come with a security cover to prevent control settings from being changed accidentally. The POWER/STAND-BY indicator does double duty: green means the power is on, while orange notifies users that a "stand-by" command has been received from an external control unit. And the REMOTE indicator on the rear panel illuminates when control signals are received from an external device connected to the DATA port.